Westbury suggests a one-piece case-hardened mild steel camshaft, or alternatively a bit of scrap alloy steel left in the found condition. Hemingway supply a piece of ½″ silver steel (drill rod) which I think they intend to be left soft. 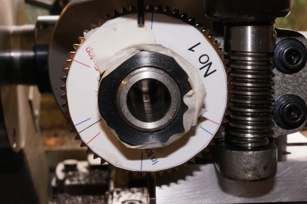 Other writers favour a built-up camshaft with cams fixed with Loctite. This has the advantage that different materials can be used for the shaft and the cams. 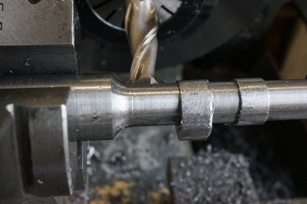 If a solid mild steel camshaft is case hardened then the cam profiles should be completed and carburised but not hardened, so that the rest of the shaft surfaces can have the case machined away. The job is then re-heated and quenched to harden the cam surfaces. Finally, the soft parts can be finish machined. 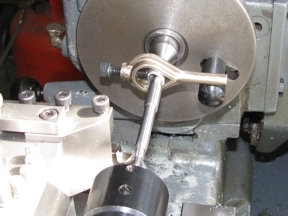 A fully hardened silver steel shaft would be far too short: the ends, particularly the taper and thread would need to be thoroughly tempered, but without letting down the cams. Either way, a certain amount of distortion is highly likely. Built-up construction avoids all these problems, but does present a different one: alignment of the cams during assembly. 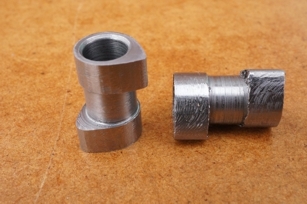 I intend to make a built-up camshaft, but rather than individual cams, I intend to make a joined pair for each cylinder. These will be hardened silver steel. The camshaft will be made from high tensile steel. After drawing several layouts for mounting a carrier plate for the ignition sensor magnets to try to get a compact arrangement, I finally decided to make this as a ring attached directly to the timing gear. This enables a short camshaft to be used with the gear retaining nut inside the ring. Before I come over all analytical, this needs to be kept in perspective. This is a small side-valve engine intended for modest speed and performance: unless there are silly errors the acceleration forces in the valve gear will be very low. Secondly, an interesting exercise I have yet to perform is to see how accurately I can set out the cams using the pencil and paper methods available to Westbury. Thirdly, a stack of these engines, particularly the Seal, which has identical valve gear, have been built successfully, probably mostly without modification. Having said that, I have looked at the design and I do find things are not quite right, so I am hardly going to plough on regardless. I would like to achieve silky smooth operation of the valve gear, to minimise noise. I use cam angles, not crankshaft rotation, throughout this discussion. 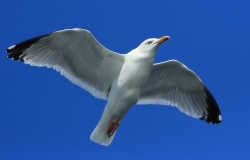 Westbury does not give much detail about the cam design and manufacture in the Seagull articles, referring readers to the prior series on the Seal, and it is necessary to read the relevant parts to get the full picture. The first thing you find when trying to reproduce the cam design with CAD is that the given dimensions don't work. With the given base circle diameter, flank radius, angle, and lift, the noses come out too small, at pretty close to 1⁄64″ for the inlet, and 1⁄16″ for the exhaust, amounting to 1⁄64″ undersize in each case. The resulting profile of the inlet cam just looks too sharp. This exacerbates a problem with the tappets, which I discuss below. Any of the parameters can be altered to adjust the nose radius. Curiously, I have found geometric constructions for all of them, except for finding the nose radius given everything else. I have, however, found a simple trigonometrical solution for that case. The figures below are the result of my geometric constructions using Autosketch, quoted to 4 places. By increasing the flank radius to 5⁄8″ both nose radii come within a few thou of the design figure. For exact nose radii, the flank radii should be 0.6211″ and 0.6633″ for inlet and exhaust respectively. The construction for finding the radii is a bit more difficult and it would be harder to get it accurate on a drawing board as it involves finding the intersection of two straight lines that are at a small angle. Increasing the opening angle by 2.8° for the inlet and 3.8° for the exhaust also does the trick. The geometry for this is quite easy. Reducing the lift, by 0.0044″ to 0.0737″ and by 0.0064″ to 0.0717″ respectively is another option, the easiest construction of all. Finally, the base circle could be increased, a method which would also effectively reduce the lift. The radial increments are 0.0037″ and 0.0046″ this construction was also a piece of cake, once I had worked out how. Using Westbury's method of turning the flanks and then filing the nose radius to a gauge would seem to come nearest to the reduced lift solution. I need a bigger nose radius on the inlet cam to get over the tappet size problem and am going for a slight increase in the inlet cam angle to 122°, combined which a reduction in lift of 0.002″ which together give a nose radius of 0.0335″. I will leave the exhaust cam with the slightly undersize nose radius as designed, as this one is not a problem. This alteration allows me to retain the design flank radius, which gives an appropriately mild cam, keeping the acceleration and maximum velocity down. It is the velocity that determines the necessary tappet diameter. 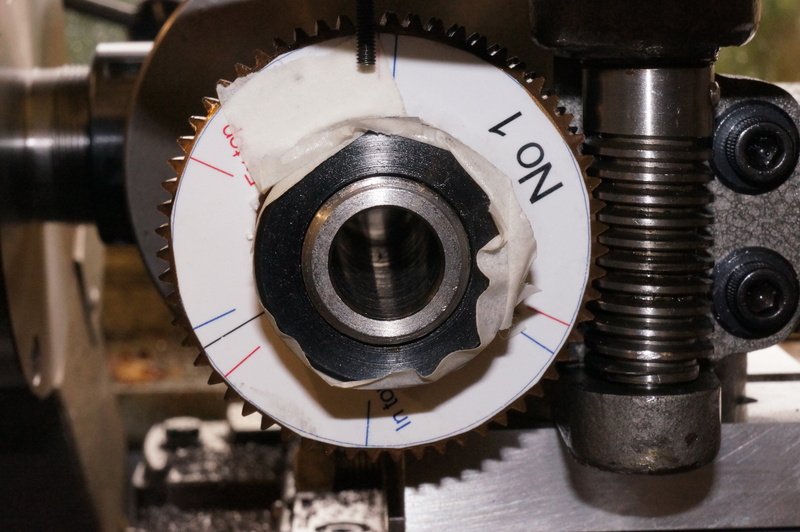 Opening the inlet valve 2° of crankshaft rotation earlier, and closing it 2° later, while losing 2½% of the lift should not make a huge amount of difference. The base circle needs to be relieved, by 0.005″, to provide the tappet clearance. The transition between the clearance and the start of the cam flank needs a bit of thought. In the Seal articles, where Westbury describes his favoured eccentric turning method, he suggests that the relief is provided by making a series of cuts round the heel of the cam 5 thou deeper than the flank cuts, and taking them to "within about five degrees of the flank positions". If this means what I think it means, then the apparently innocuous cut of 5 thou would actually cut substantially into the start of the flank proper, resulting in reducing the valve opening by more than 11° each side, and removing an important part of the acceleration curve, causing an impact when the cam flank eventually arrives at the tappet. To avoid cutting into the flank, this treatment would need to stop at 16° from the flank start. The harshest solution is described by Ron Chernich, in which a tangent to the heel radius is taken from the start of the flank, but this would produce an odd looking sharp discontinuity on the cam surface. Actually, the flank-radius-minus-5-thou solution does just the same. Elsewhere, I have seen a description of a 'constant velocity ramp'. Playing around with this it looks as though a smaller radius at the end of the flank and then a short tangent between that radius and the clearance radius will provide what I want. 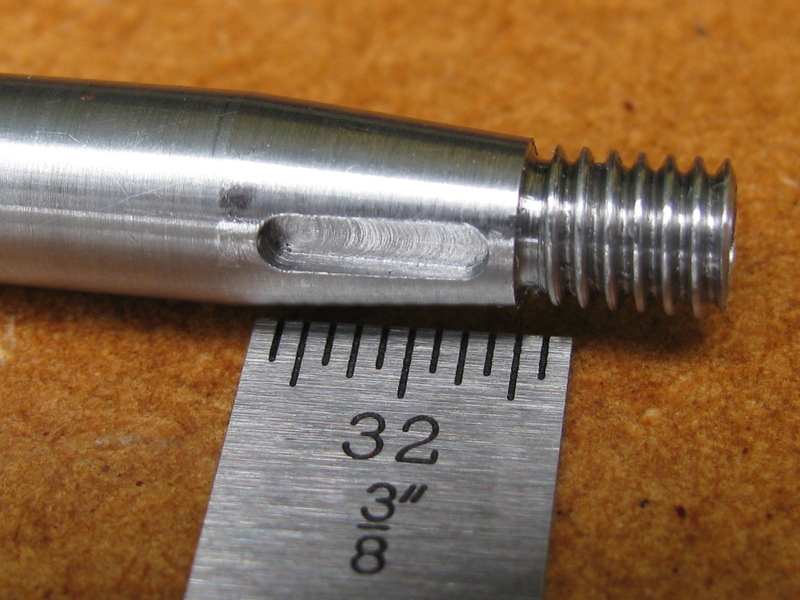 In the Seal articles, Westbury mentions that some might consider a 0.005″ tappet clearance excessive and explains that he has specified it to make allowance for the some distortion in hardening a one-piece shaft. As my built-up shaft will not suffer from this problem, I am intending to halve the clearance. This makes the design of the transition easier. I do not know what temperatures the valve stems and cylinder body will get to, but some rough calculations show the clearance is unlikely to change much as the engine reaches running temperature. Measuring the clearances with a hot engine would be good, but may not be easy. The design tappet diameter is too small. Even as redesigned, the inlet cam needs a tappet 0.277″ diameter, and that is the absolute minimum, momentarily reducing to point contact at the edge of the tappet at the transition between the cam's flank and nose. The radial offset, from centreline, of the contact line between cam and tappet is directly proportional to the valve velocity at that point in the rotation. To maintain line contact across the full width of the cam throughout would require a tappet about 11⁄32″ diameter. As there are places where the existing ¼″ tappet holes in the crankcase have barely ¼″ depth, and I would not like to have a tappet bearing bore shorter than its diameter, I think tappets any larger in diameter than design would need to have bushes. The bush can project into the crankcase so as to just clear the cams, and this would provide some extra support just where it is needed. The 7⁄16″ centres spacing of the tappets does not leave a lot of room between the two for bushes, though. An 11⁄32″ outside diameter bush would allow an adequate 3⁄32″ between and could be bored for a 9⁄32″ tappet. In combination with the redesigned inlet cam this is big enough to allow line contact throughout, although the line still reduces to no more than about 1⁄20″ long at the transition point. There is an excellent analytical tool for camshaft design and generation available on Ron Chernich's pages. No doubt the ideal method would be to finish grind the hardened cams. This would require some kind of grinding machine. Attempts at end milling to a table of offsets works well enough, but I have tried a brand new slot-drill and a single-point cutter in the form of a boring bit. In both cases the finish I obtained was atrocious. 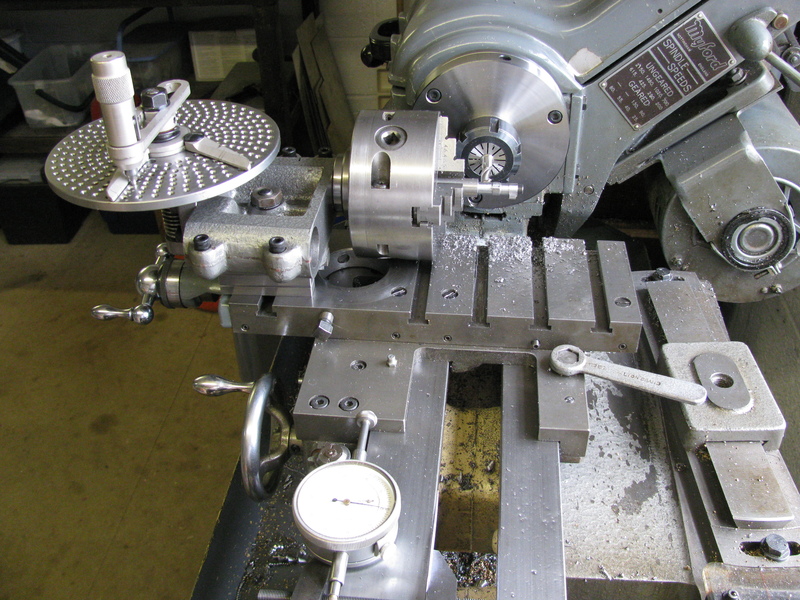 A trial using a grinding wheel in the lathe and using the cross-slide and dividing head for offsets gave a surprisingly faceted result, though this may have been partly due to stiffness in the cross-slide. The surface finish was good. This should perhaps be tried again more carefully. I parted off the two paired cam blanks and an extra bit to use as a test piece to check how the bore size comes out after hardening. In the supplied state it was very nasty to cut, as silver steel generally is. I normalized the pieces by heating to bright red and burying in vermiculite until cool. While this was going on I made a sample tappet bush for the crankcase, 9⁄32″ bore and 11⁄32″ outside diameter, as an aid to deciding how to deal with the undersize tappet problem. When it had cooled, I drilled, bored and reamed the cam test piece. Boring was still pretty nasty even after normalizing, but the reaming operation was OK. After hardening and cleaning up the fit was good, with a little play detectable, suitable for Loctite. I faced the cam blanks to length and then set them up in the 3-jaw chuck with a packer, about 1mm thick, under one jaw to throw the blank off centre a little. The bar provided is ½″ diameter, which gives no machining allowance for the nose radius unless the bore is offset a bit. As the cams are 110° apart the high side can be shared between them. I centred and drilled 5.9 & 6.2 mm at 600 rpm and reamed ¼″ at 200, all with plenty of RTD compound. I tried a newly obtained 8 mm square parting-tool holder for cutting the groove between the two cams. Because it holds the blade at an angle to provide a bit of top rake, it is not possible to get the tip on centre-height using my 5⁄16″ quick-change tool holders. Forgetting that I have a special for 3⁄8″ tools, I tried packing up the back end of the parting-tool holder to tilt the business end down a bit. Putting radii on both sides of such a small tool bit was not easy either, and the whole rather unsatisfactory arrangement produced a rough finish. 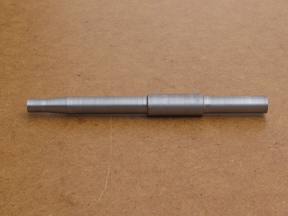 For the second blank I altered the radii on an existing 1⁄16″ grooving tool. This also produced an awful surface, which I cleaned up a bit with a needle file. The remaining flank of the exhaust cam offered an opportunity to try to improve the surface finish. 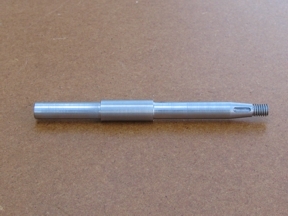 I tried using a single-point boring bit as a fly-cutter, but the result was no better. 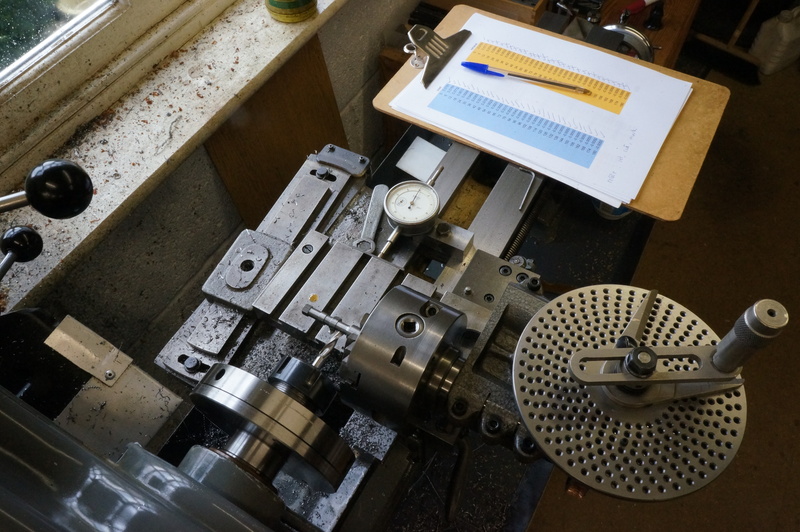 I had decided to have a go at grinding the cam profiles, initially trying using the same incremental offset method, as this required little extra setting up, using the lathe spindle to mount the wheel. All that was required was an arbor. I decided to make one that would mount a spare 6″ wheel in my largest ER collet. These jobs took up pretty much all my workshop time for a month. For dressing the wheel the whole lathe was covered in newspaper which went straight in the bin afterwards. I hardened the scrap cam set. It is now a bit too tight on a ¼″ ground bar, so the final ones may need lapping internally to allow a loose enough fit for adjusting the angle before the Loctite starts to set. Because it was only a trial I did not take enough care in setting up for grinding. I used a magnet to fix the dial gauge in place and this must have shifted during the job, resulting in excessive cuts, a wrong profile, overheated work and a well-glazed grinding wheel. Although the mounting block for the dividing head was a vast improvement, the cross-slide was still stiff. Despite using one degree increments on the dividing head, even the good parts of the resulting surface still seemed to be faceted, to an extent that I had not expected. Having finalised the design of the magnet carrier for the ignition timing (it will be a ring bolted onto the timing gear) I now know the camshaft's length. I faced the already roughed out piece to the finished length, centre-drilled No.1 size, and set it up for turning between centres. With a freshly ground tool I took small cuts off the centre portion. At the last minute I remembered to check for taper and found it was slightly out. 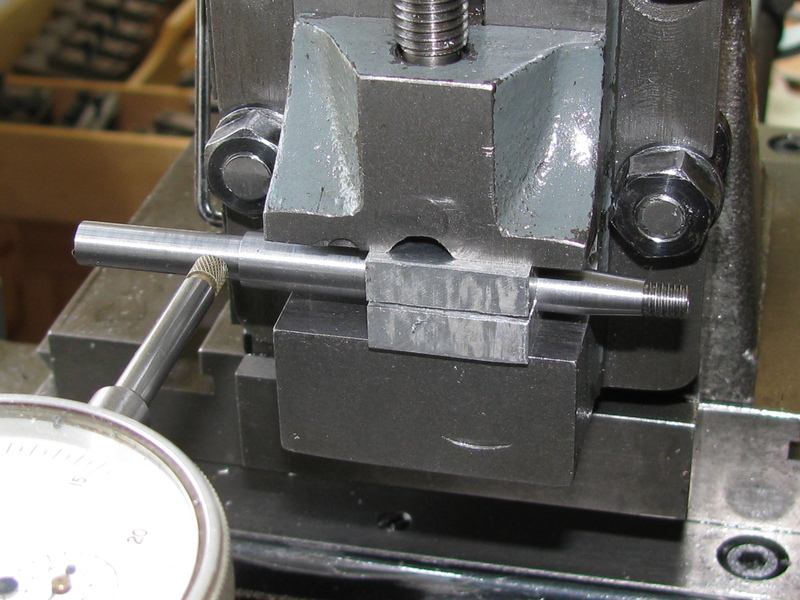 After adjusting the tailstock and turning the centre parallel, it was 0.0003″ below the nominal 5⁄16″, which does not matter. The surface is not as smooth as I would have liked, which suggests the bearing seats may need to be lapped. The taper turning attachment has been set at 5° for months, so that was easy. The taper was completed in 3 cuts. I don't understand my own notes, but it looks as though the finished size may have been arrived at a little sooner than expected. The taper setup was then changed for screwcutting. The correct pitch for 2 BA is 0.81 mm or 0.0318898″ (to the nearest ten-millionth). Using Duncan Munro's ML7 gear program and my selection of change gears which includes some extras, I came up with a train that gives 0.0318893″, a theoretical error of 0.0000005″ which is probably good enough. With the topslide set at the half-angle of 23¾° cuts were taken to 0.019″ deep on the topslide dial, leaving 2 thou to come off radially. 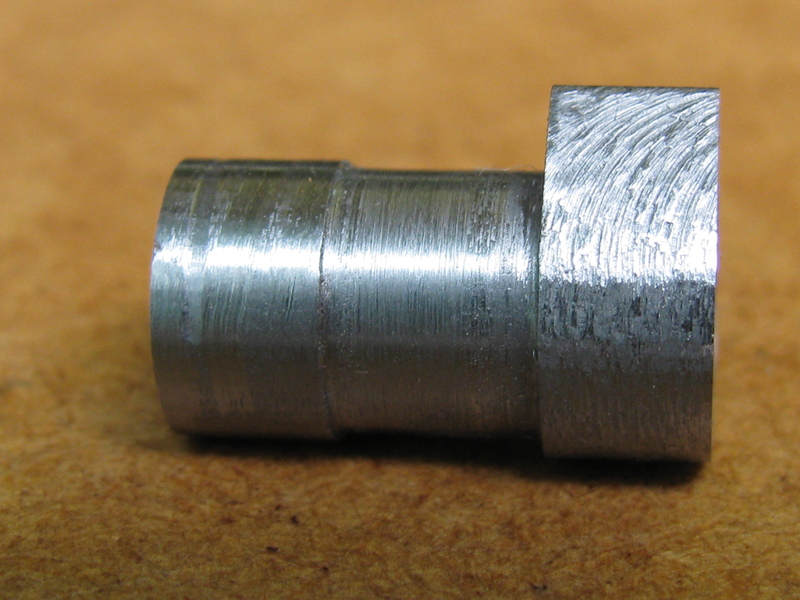 At this point I remounted the job in a collet and finished the thread with a well expanded 2BA die in the tailstock die holder, contracting the die until a stock 2 BA nut would just go on smoothly. Next, I set up the vertical slide and made a copper lap for the camshaft. The original design calls for a woodruff key, but for that I would have to make a tiny cutter. I decided on a square section key, the same size as for the crankshaft pinion. For ease of manufacture, I have set the key parallel to the camshaft axis, rather than following the slope of the taper. I lapped the bearing and cam seating surfaces both ends of the camshaft to ¼″ dead on, or less than 0.0001″ oversize in parts, using the copper lap with 800 grit garnet paste. This was pretty slow in action, and seemed to take much more off the lap than off the job. Lapping has not removed all marks from the turning tool, but the surface is generally very good and the bearings feel very smooth in operation. Finally, a chamfer was cut at the free end. Yesterday I 'normalised' the remaining piece of ½″ silver steel from the kit, and a piece of 5⁄16″ from stock, for cam blanks and tappets respectively. The process is to heat to bright red and quickly bury in a bed of vermiculite to cool slowly. After a bit of indecisive messing about and tidying up, I made another cam blank out of non-normalised silver steel to provide a pair. As before: parted, faced both ends and to length, eccentric bored, and grooved on the mandrel which, of course, had to be set to run true in the Griptru chuck. 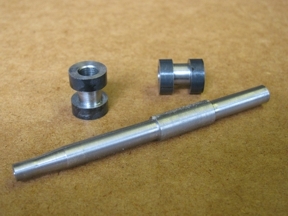 I started work on a longer stub mandrel for milling the cams, designed to provide clearance at each end for the cutter. 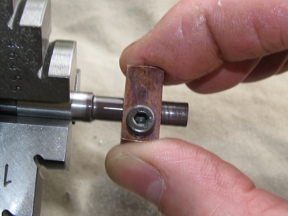 I started by making a clamping nut with an integral sleeve, intended to ensure it clamps up square without distorting the rather slender mandrel. 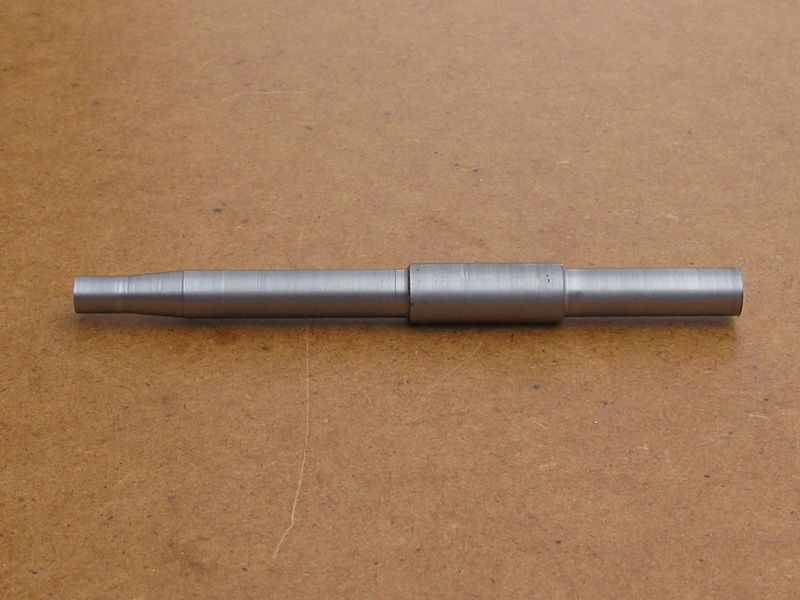 Finally, I turned all the diameters on the mandrel. 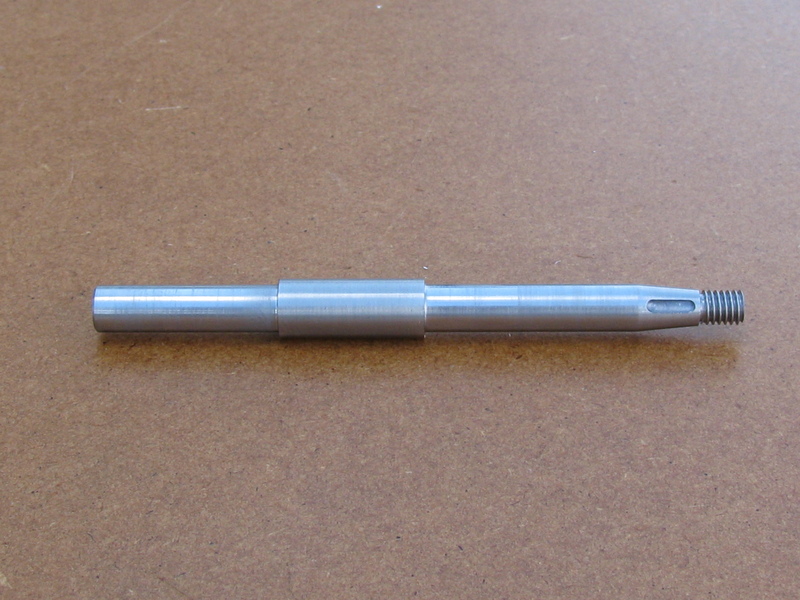 The first job today was to cut the 1/4″ x 32 TPI thread on the mandrel. 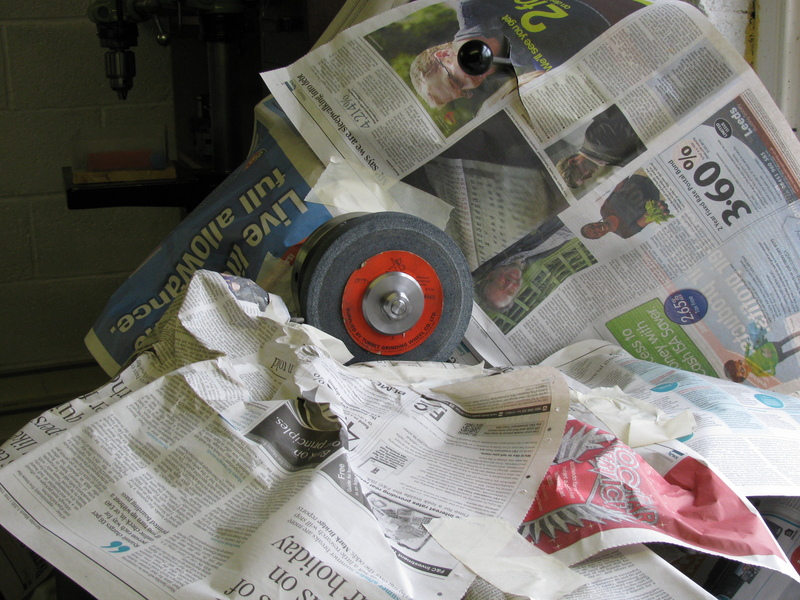 This was screwcut and finish chased to ensure accuracy. Next, I started work on a block to enable a DTI to be clamped directly to the lathe bed, rather than using the magnetic base which use last time and managed to move part way through the job. I sawed out a lump of steel and machined all 6 faces, using the 4-jaw chuck, and drilled and tapped a hole in one end for the DTI clamping bolt. I then cut out a clamping plate, drilled a hole in the middle and mounted it by the hole on a stub mandrel to turn it over the ends to fit between the lathe bed sheers. Lastly I drilled the hole through the block for the clamping bolt. 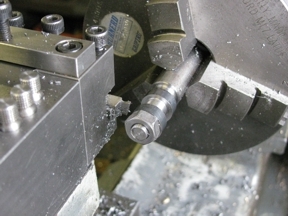 After reassembling and adjusting the dividing head and changing to the No 2 division plate I mounted one of the normalised cam blanks for milling. I started on the exhaust cam. Coming round the nose, I was surprised to find that in a couple of positions the cutter was not touching. Near the end I lost count of my position and I had forgotten to mark the starting position anywhere. The base circle measures 0.361″, against a nominal of 0.343″ diameter, meaning there would be 9 thou to be ground off rather than the intended 0.005″. Also, the nose of the cam was in the wrong place in relation to the blank. After this I drew up a pair of protractors, showing the salient angular relationships for each cam pair, in the hope that this would help to avoid losing count completely. I printed them off, cut them out and fitted one to the face of the worm wheel. I put a small bolt through a hole in the index plate to act as a pointer. Today, at the third attempt, I managed to produce a cam blank with a pair of good cams, and then went on to make another. I used the blanks that had been left in the as-supplied state, but the finish was still very craggy. The photo shows the general set-up, using the bed-mounted dial gauge to estimate the offsets to 0.0001″, and including the all-important table of offsets, blue for inlet, yellow for exhaust, with each one being ticked off in turn. As the cams are only being rough machined, for later grinding (somehow), I used a relatively coarse increment of 6°, this being one whole turn on the dividing head.